Aunt Em dropped her work and came to the door. One glance told her of the danger close at hand. "Quick, Dorothy!" she screamed. "Run for the cellar!" Toto jumped out of Dorothy's arms and hid under the bed, and the girl started to get him. Aunt Em, badly frightened, threw open the trap door in the floor and climbed down the ladder into the small, dark hole. Dorothy caught Toto at last and started to follow her aunt. When she was halfway across the room there came a great shriek from the wind, and the house shook so hard that she lost her footing and sat down suddenly upon the floor. Then a strange thing happened. Continued next week. Tomorrow's installment from A Retreived Reformation by O' Henry. The trailer of Judy Garland's breakout movie of 1939; why wasn't the rest of Baum's Oz books made into movies? 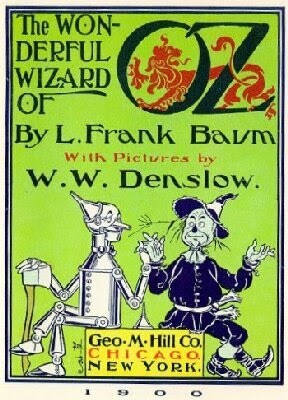 Illustrated: cover of the book's first edition in 1900. But Enough of MLK, Vote for Me . . .